Around the world, governments large and small are exploring Participatory Budgeting. This is a process of democratic deliberation and decision-making, and a type of participatory democracy, in which ordinary people decide how to allocate part of a municipal or public budget. Participatory Budgeting allows citizens to identify, discuss, and prioritise public spending projects and gives them the power to make real decisions about how money is spent. Put another way, it’s like crowdsourcing feedback on the spending of public funds. When Participatory Budgeting is taken seriously and is based on mutual trust, local governments and citizens can benefit equally. In some cases, Participatory Budgeting even raised people’s willingness to pay taxes. Until recently, North Americans have lagged behind their European and South American counterparts at apathetically low rates. 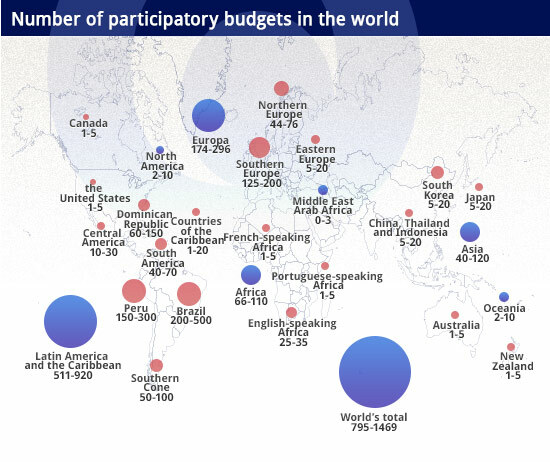 By the end of 2012, North America was estimated as having completed barely a handful of Participatory Budgeting projects while the rest of the world had completed thousands – (see graphic, below). While it was estimated that the current world total of projects completed is somewhere around 1500, Canadians and Americans had probably delivered around ten – and that’s being generous. As the self-proclaimed purveyors and protectors of democracy, surely North Americans would have found these statistics startling. Europe had completed as many as 200, and Africa as many as 110. Even Asia had their share of Participatory Budgeting projects estimated to be as high as 120 – and that included numbers from China! The only region behind North America was the Middle East – a region plagued by social, political and religious unrest. Moving forward, I believe a number of municipalities in Canada and the United States are catching on and embracing Participatory Budgeting tools, and trust in the process is building. In fact, some research points to as many as 75 Participatory Budgeting projects planned for 2016. That’s an encouraging leap forward! I personally like these sorts of interactive platforms because they enable the layperson who is not intimately tied to the inner workings of a budget to immediately visualize the impacts of an apparently casual decision. Using a variety of buttons on a dashboard, anyone can immediately see how a change in spending on one line item will potentially impact several other municipal service areas. As an example, take a look at the City of Mississauga’s Budget Allocator Project. Note how a casual visitor can immediately interact with the budget? The default shows that the city has a budget surplus, but any changes in spending on transit, parks and recreation, roads, and traffic maintenance lands you potentially in the red – begging taxpayers to cough up as much as an additional $66.15 annually. It’s clear from these examples that Participatory Budgeting isn’t just for city councils – it can be used wherever you are trying to determine the best fit for community money. The applications are limited only to your imagination, and there are practical uses for Participatory Budgeting in healthcare, parks and recreation, transit, emergency services, land use planning, technology – just about anywhere, really. If you are interested in exploring Participatory Budgeting further, take a look at some more case studies right here on Budget Allocator. What is your take on the uptake of participatory budgeting in North America? Article by Mark Pivon, our Canada Engagement Solutions Manager.